Why Los Angeles?, originally uploaded by LeeLeFever_TwinF. We've heard interesting responses when I tell people that I'm excited about my first visit to Los Angeles. Among them: "Eh, its not that great", "don't bother", and simply "why?" While LA has problems, I think residents and former residents just like to pick on the city in a self depricating sort of fashion. 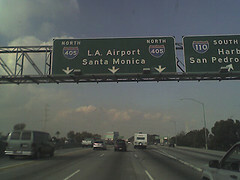 I am excited to have the LA experience, freeways and all. Even Sachi thinks that is a little weird. I'm not interested in LA because of the celebrities, movie studios, the Sunset Strip or the Mann's Chinese Theater. I want to see those things, but what draws me to LA is the fame (or infamy) of the city itself. On a worldwide scale, Los Angeles is very well known and to many foreigners we met, one of the most coveted destinations in the US. We were both surprised to hear this as Americans would likely suggest alternatives to LA for a visit. Like me, they are interested in LA because it's famous more than beautiful, interesting or atmospheric. It is famously American. I've run into this feeling many times on the trip - I want to see a city, a building, a sculpture not because I value it, or can even appreciate it, but because it is so famous. An example is Michaelangelo's "David", which is an amazing work of art, but one whose world wide fame supercedes its workmanship in my eyes. If you strip away all the fame, the experience of seeing the David is less exciting. In this way, fame is not a factor of quality, but quantity. I want to experience it because I've heard about it so many times. And so it is for LA and me. The fame of the place itself, its problems, its beauty, its freeways, materialism and culture - it's interesting to me not because of its quality, but how much a part of the American experience it represents. Good or bad, LA is an experience I want to have.